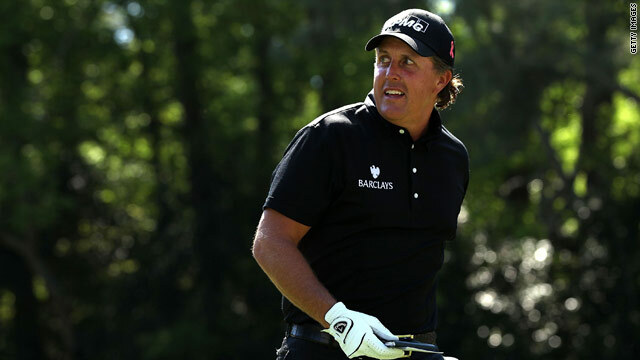 Mickelson charged to victory on the final day of the Masters at Augusta. (CNN) -- Phil Mickelson gets another chance to claim the world number one ranking from Tiger Woods at this week's Colonial tournament in Texas but is trying to put all thoughts of the achievement to the back of his mind. The 39-year-old American has spent much of his career in pursuit of the all-conquering Woods and has never claimed top spot, but he adds a note of caution as he prepares to tee off in Texas on Thursday. "I think it's one of those things you will look back on in your career if you've accomplished it, whether it's one week, a year or whatever the time frame is, it would be something very special," he told the official PGA Tour Web site. "But to accomplish that, I can't focus on that. That's a result. "I still need to go out and play like the No. 1 player in the world, so I've got some work to do." Mickelson has cut the gap on 14-time major champion Woods, who has made only three appearances since being embroiled by problems in his personal life which emerged last November. He had the opportunity to take the top spot at last month's Players Championship, but the Colonial represents a better opportunity, with Woods now sidelined by a neck injury. Mickelson won the tournament in 2008, but was unable to defend his title last year as it was revealed that his wife Amy was battling breast cancer. "Fortunately it's on a golf course that I have played well on in the past and that I enjoy. I'm looking forward to that challenge and that opportunity to overtake the top spot," he said. In solidarity with the Mickelsons, players and officials wore pink during the third round of last year's tournaent to raise awareness of breast cancer and the world number two has not forgotten their gesture. "Last week, Amy and I commiserated over our one-year anniversary and this event really helped us get through some tough times. "It meant a lot to us and gave us a huge emotional boost at a very difficult time for us," he added. Steve Stricker won last year's event in a run that saw him briefly rise to number two in the rankings, but he has been sidelined since the Masters with a chest injury. "I don't know if it's totally healed yet, but I'm swinging without any pain," he said before turning his attention to Mickelson. "He is almost the defending champion as well this week," Stricker said. "I thought it was the greatest feel-good story in golf when he won at the Masters, and seeing Amy there."